I’m sitting in the repair shop waiting for my car to be finished and The Price Is Right (TPIR) is on the TV. Drew Carey receives a bear hug from the petite woman who ran onto the stage. He reveals the next game and the prizes to her. The announcer’s voice rings out, “…a new-ew-ew-ew car!” and the audience cheers wildly, insanely. The contestant shimmies like jello and swoons with pleasure. “A new car” crowns the prize pyramid on TPIR. Winning the car fulfills the American Dream. I want to go to California and be a contestant on TPIR. I want to jump and carry on like a maniac. It wouldn’t suffice to sit in the audience; I’d have to be assured a chance in Contestant’s Row, the closest to Nirvana you can be on TPIR without actually being there. I’d want to be in the front row wearing a t-shirt with a sappy saying like “It’s My 83rd Birthday and I’m Celebrating on TPIR,” “Waiting 40+ years to ‘Come On Down’,” or “Bid $1 More Than the Previous Contestant.” I know the shirt is the key to getting to Contestant’s Row. My TPIR wishing features (sorry, Drew) Bob Barker (never just “Bob”) in his dark-haired years, a blast from my youth. Johnny Olson (not Rod Roddy) enthusiastically announces, “JustHavingFun, c’mon down! YOU are the next contestant on TPIR!” and I look around for JustHavingFun then give a double take when I realize he’s calling me! Jumping up from my seat at the back of the studio and climbing over four people, I stumble into the aisle. I run to the stage and the camera hungrily emphasizes my massive bosom’s vertical motion and my monumental tummy’s sideways lurching. The shirt must have worked. In Contestant’s Row I’m smokin’ hot! Jumping up and down, I guess the actual retail price on the price of the range, lower than everyone else’s bids. They all bid over the actual price! Ding ding ding ding! I get a cash bonus, too! Now I’m ready for the Big Time! I sprint up to the stage… next to Bob Barker!!! He greets me and I stutter my two-second intro: “I’m a writer slash environmental scientist from Pittsburgh trapped in NYC. I also like doodling, burping (thanks Soda Stream! ), and detangling my hair.” “OK,” Bob will say, looking at me with his trademark interested look, “let’s play TPIR.” I grin and do the happy dance. Toasters, cat treats, trips to Cancun, Dior sunglasses, smoker grills, and motorbikes–I know all the prices. I’m in the groove! I could really clean up. I hope for the ‘Clock Game’ (Higher! Lower!) because I don’t like games that rely on chance (except Plinko–everyone loves Plinko). I’m ready to putt in the ‘Hole in One’ game. I can select the wrong number in ‘Squeeze Play.’ I’m ready. Wonder what game it will be…. I get ‘Any Number’ with the car, a microwave, or the darned piggy bank. Of course I win the car. I go on to the Big Wheel, win that, and then to the Showcase, winning both Showcases. Another car, a catamaran, and a trip to Belgium. Easy peasy. Bob looks at my shirt. It says, “I came to TPIR and won two cars, a boat and a trip to Netherlands.” Close enough. Bob Barker hugs me and says, “Remember to have your pets spayed or neutered.” He could say whatever he wants at this point. I’ve won enough to boost the economy of a small country and life is g-o-o-d. Or at least, life is consumer g-o-o-d-s. But who needs California and TPIR? I could get that new-ew-ew car… for $1.29 at Target. 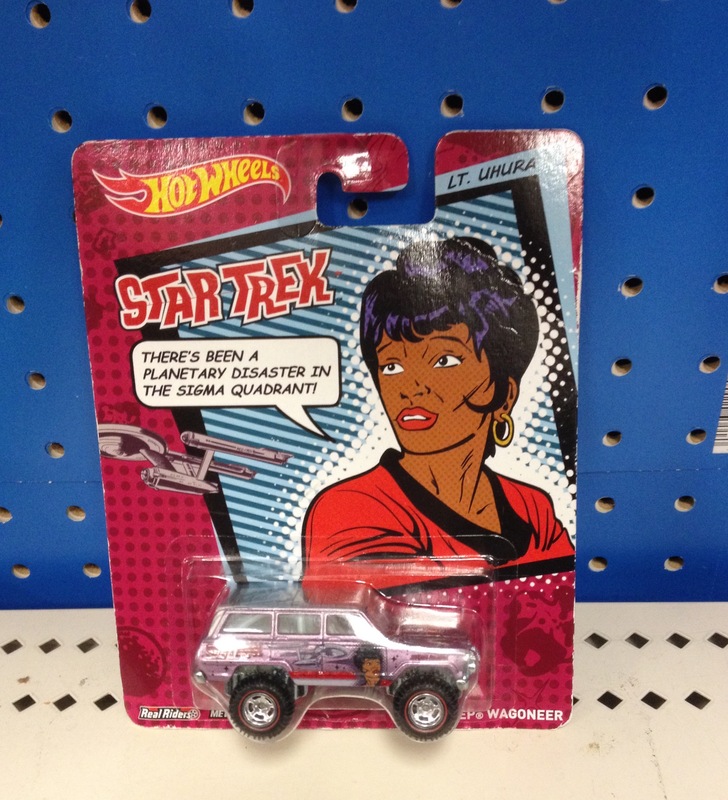 A very special customized vehicle, with girl power by Lt. Uhura. That way I’ll be prepared if there’s a planetary disaster in the Sigma Quadrant.